Low tide at “C” Street beach in Ventura. You don’t see it often - people riding a bike on the beach, or, in this case walking his bike on the wet, compact sand. On the promenade the City of Ventura provides a shower for the surfers and swimmers to rinse off the saltwater from their wetsuits and boards. The homeless use the showers also. The local schools are out for fall break. On the Ventura boardwalk or promenade this young skateboarder was taking a break to watch the surfers st “C” Street. This”stand up” paddle boarder was taking a nice ride in the soft surf just past “C” Street but before the point. Temp today 74 degrees and sunny and almost everyday there is some wind. Into the studio and some painting for the rest of the day then home for the World Series. Check out some of my baseball drawings on my feed I’ve been doing about the World Series. I don’t think my wife appreciates me watching sports in the evening. The series will be over shortly my sweetheart. As I am a sports artist I am suppose to keep up on these things. 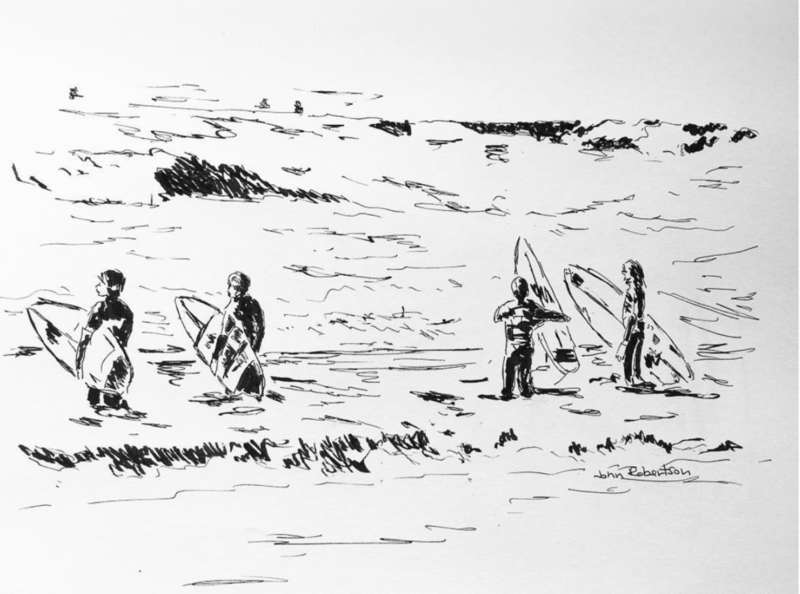 Here is a group of young surfers all entering the water at the same time at Surfers Point,Ventura, Ca. Small swell today and with those Santa Ana winds blowing offshore. Beautiful day if you like 80 degrees and sunny and being at the beach. Good surf is still available at Ventura’s “C” Street and “Surfers Point”. And with that comes more surfers and lifeguards. As my studio is not too many blocks from these locations it is natural to draw my times on the beach. Tropical Storm Rosa has brought good surf to Ventura’s “C” Street and “Surfers Point”. And with that comes more surfers and lifeguards. As my studio is not too many blocks from these locations it is natural to draw my times on the beach. Today the surf is a little bigger and better than yesterday and I was able to get down to “C” Street early and walked up to Surfers Point. They were having a local surfing contest so there were quite a few good surfers. Surf’s up a bit at “C” street this morning running 3 to 4 feet and supposed to be a little higher this afternoon. Also it should be a little bit bigger tomorrow morning and I will go down for the early morning light. I live only a couple of blocks from the beach and Ventura’s “C" Street break. My studio is even closer. When on the beach in Venice Ca. I noticed that the LA County lifeguard towers are different than the lifeguard towers in Ventura Co. This tower is at the Venice breakwater. I’m taking up the inktober 31 drawing challenge to do a drawing a day for 31 days. And here is today’s drawing. I live only a couple of blocks from the beach and Ventura’s “C" Street break. 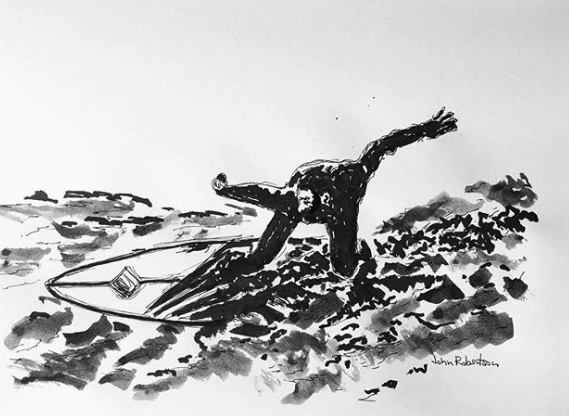 My studio is even closer, it is only natural I would draw a surfer. I live only a couple of blocks from the beach and Ventura’s “C" Street break. 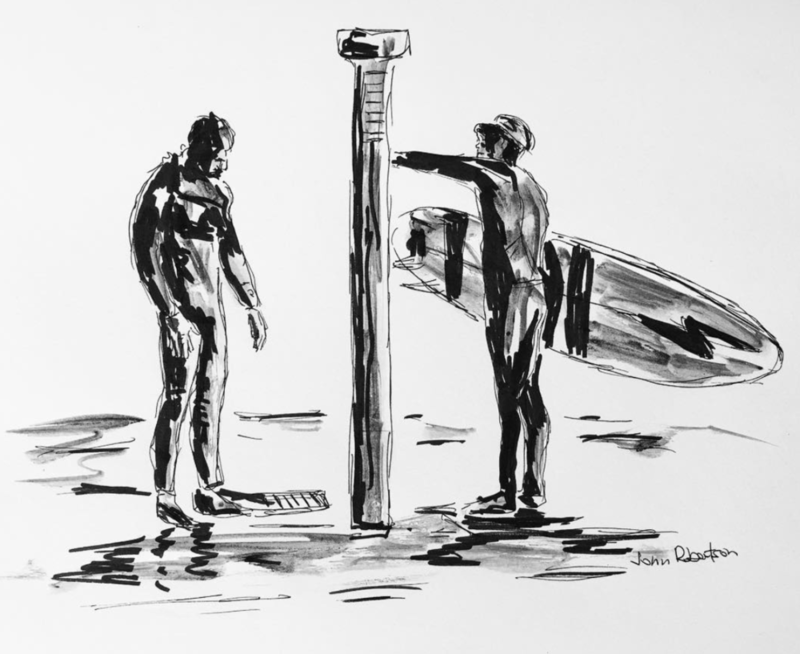 My studio is even closer, it is only natural I would draw and paint surfers. This is a preliminary ink drawing for future artwork.